It is increasingly apparent that Cristine Blasey Ford's testimony is riddled not with false memories, but outright lies. Let's give Ford the benefit of the doubt on point four. Let's assume she was that traumatized by the event. What do you have? A pack of lies. Please consider Blasey Ford's Kavinaugh Testimony Unravels After Ex-Boyfriend Refutes Key Claims. Yes, I believe Ford's accuser. 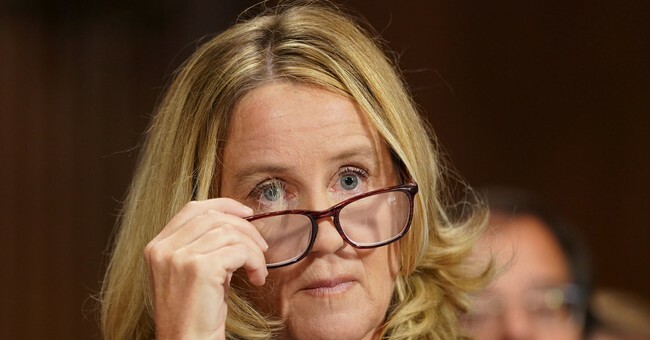 Unlike Ford, her accuser genuinely has nothing to gain. He cites specific instances that are likely verifiable including an apartment where Ford lived that was 500 sq. ft. He accuses her of credit card fraud. This should be easy enough to verify. Ford's testimony about installing a second door on an apartment as an escape hatch has already been blown to smithereens. It turns out that the second door was likely put in to accommodate tenants that Ford leased a portion of her home to. There is of course no guarantee that is true. However, one can drive a truck through the holes in Ford's memory. None of this "proves" anything. Allegations never prove anything. But if one is to believe Ford on the flimsiest of evidence, then we may as well believe evidence that is far more believable to start with. That aside, I would rather the FBI investigation go on further. If the FB can prove Ford flew in prop planes, attempted to cheat her former boyfriend on credit cards, put in a door to provide a private entrance for tenants, or gave polygraph advice to friends, then we can properly discard her entire slimy testimony. I am willing to take a position that Ford is indeed a liar, perhaps coaxed by or intentionally setup by Senator Dianne Feinstein. That is my take, but I could be wrong. Bear in mind, it's still possible, that even if her former boyfriend's allegations can be proven, that Ford really believes she was attacked. I still give her the benefit of the doubt on that point. If Ford told outright lies, does that mean the Senate should approve Kavanaugh? It seems likely, even to me, that Kavanaugh was not 100% truthful in his responses either. But wasn't that what it was all about in the first place? There was never any intent (by either side actually), to uncover the facts. If the facts do come out, it may be by accident, more than anything else. There is new evidence to consider, and most of it suggests Ford is an outright liar. Let's check out Ford's former boyfriend's story. Maybe its a lie. Maybe the FBI can verify at least parts of it. If so, that is the best for Kavanaugh. If not, that is the best for Ford. I stated my beliefs, but I am willing to change my mind. Most aren't. Meanwhile, I would rather let the FBI finish its job. Declare the Allegation Period Over. Everyone has had a chance to speak. If they failed to do so, it's their own fault. We need to do this or the alleged search for the truth can last a decade. Investigate all the substantial claims. That is the best process to vindicate Kavanaugh or vindicate Ford without risking the process drag on forever. At the same time, there are legitimate concerns that Kavanaugh was not entirely truthful. Yet, I wonder if you would be, I would be, or anyone else would be under Senate interrogation of what we did or said in high school or college. We are now discussing the meaning of "boofed" and "Devil's Triangle". I had to look those terms up. I never heard of either term, nor did anyone I asked. Did Kavanaugh answer truthfully? How the hell would I know? Did he drink more than he stated? I will go out on a limb here and say "probably". Did he "black out"? I never saw anyone black out from drinking so I suspect not. But how the hell would I know? More importantly, is any of this really relevant NOW? Ugliness is in the eye of the beholder. But it did. On purpose. By Senator Dianne Feinstein.